March 30, 2019, Saturday dawn, Ismael Avelino’s door was wantonly destroyed by combined elements of the Armed Forces of the Philippines (AFP) and Philippine National Police (PNP). As they heard shots in his brother Edgardo Avelino’s home, Ismael’s wife and children were forcibly led by armed masked men out of the house. Ismael’s last words was to his 10-year old child: “Take care of your mother and siblings.” Eight bullets killed Ismael. His brother Edgardo got 3 bullets inside his house as his family was taken outside by the authorities. Edgardo is chairperson of Hugpong Kusog sa Mag-uuma (HUKOM), local chapter of the national farmers organization Kilusang Magbubukid ng Pilipinas (KMP). The Commission 11 of the International League of Peoples Struggles (ILPS) for the rights of teachers, researchers, and other education personnel strongly condemns the brutal massacre by the US-Duterte fascist regime’s state forces of 14 farmers in Canlaon City, Manjuyod, and Sta. Catalina in Negros Island last March 30, 2019. But the testimonies of the victims’ families and other witnesses starkly show who the real criminals and terrorists are: the masked police and military men who barged into the farmers’ homes at the dead of the night, forcibly led family members out as they interrogated, beat, and then shot the victims, mostly in their 50s and 60s, inside their hovels. Oplan Sauron netted the most victims, 8 farmers killed all in all, in Canalon City that night. They are brothers Ismael Avelino, 53, and Edgardo Avelino, 59; Father Mechor Panares, 67, and son Mario Panares, 46; father Rogelio Recomono, 52, and son Ricky Reconomo, 28; Gonzalo Rosales, 47; and Genes Palamares, 54. Among those killed in Canlaon City is a lay minister, said Catholic Bishop Gerardo Alminaza. The two killed in Sta. Catalina were Franlen Lariosa and Anoj Enojo Rapada, a habal-habal driver and peasant leader. The four killed in Manjuyod are Steve Arapoc and Manulo Martin and village officials Velentin Acabal and Sonny Palagtiw. On top of the killings, 12 farmers were arrested, including Nestor Kadusale, 58, KMP local leader in Manjuyod. Marauding government troops continued to sow terror in farming communities the following week with bonnet-donning rangers ransacking homes of farmers in Calatrava town on April 2. Then on April 5, about 100 soldiers of the Philippine Army’s 79th Infantry Battalion besieged a farming and fishing community in Escalante City. They ransacked the homes of residents and arrested Francisco Laza, 54, Danao River Fishermen Association (DARIFA) Chairperson and Bienvenido Jipitulan, 55. While these acts were committed as part of what authorities called “synchronized enhanced management of police operations” (SEMPO), the manner with which murdered the 14 farmers is clearly reminiscent the tokhang summary executions of drug suspects in Duterte’s malevolent “war on drugs” that has claimed the lives of almost 30,000 people. The seemingly innocuous bureaucratic label is betrayed by its unironical codename “Oplan Sauron,” in reference to the dark lord of J.R. Tolkien’s Lord of the Rings novels. The Philippine state’s repressive apparatuses here clearly understands its role of sowing terror to preserve the old ruling order in behalf of the ruling Duterte clique and his landlord and comprador masters. Recent events in Negros are but a continuation of Duterte’s feast of killings that include the “Sagay Massacre” by paramilitary groups of 9 farmers in Sagay City, Negros last October 20, 2018. The farmers were occupying a Hacienda to assert their land reform claims and cultivate vegetables to survive the tiempo muerto dead season between planting and harvest. This was followed by the killing of the “Sagay 9” family’s attorney, human rights lawyer Benjamin Ramos, 56, on November 6, 2018 then the first round of SEMPO Oplan Sauron raids on December 27, 2018 that resulted in the murder of 6 farmers and the mass arrest of over 50 in Sta. Catalina and Guihulngan City, Negros. The killings is the materialization of Duterte’s heightened anti-communist hysteria and promulgation of Draconian measures like his Memorandum Order 32 issued last November 22, 2018 which called on the PNP and AFP to exert all efforts to crush “lawlessness” in the regions of Bicol, Negros Island, and Samar Island. Along with Mindanao, which has been put under Martial Law since 2017, what all these places have in common is their being hotbeds of peasant resistance against extreme inequality between a handful of despotic landlords and landless peasants. Negros itself remains a stronghold of the feudal hacienda system that has been in place since the time of Spanish colonialism. According to the human rights group Karapatan, 60 out of the 205 extrajudicial killings of farmers in relation to land disputes all over the Philippines since Duterte assumed the presidency in 2016 took place in Negros. The island is also the site of the infamous “Escalante Massacre” of 20 protesting farmers during the Ferdinand Marcos dictatorship years in September 20, 1985. We join today’s Global Day of Action for the Negros 14. We call on our fellow education workers across the world to spread the calls for justice for the victims of the wave of brutal killings in Negros. Let us make the calls to stop killing farmers, stop the killings, and stop the attacks by the fascist US-Duterte regime resound. All those who have accumulated blood debts against the Filipino toiling masses — from the PNP Region 7, PNP’s Special Action Force (SAF) and Regional Mobile Force, and the Philippine Army’s 94th Infantry Brigade of the AFP right up to the highest rung of the chain of command, President Rodrigo Duterte himself — must be held accountable and brought to justice. 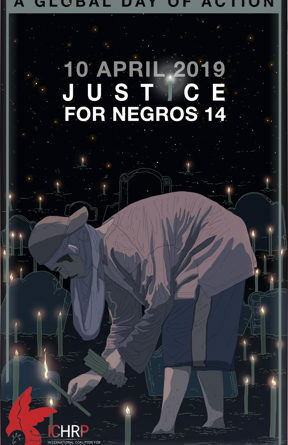 Justice for Negros 14! Stop Killing Farmers! Stop the Killings! Stop the Attacks!